Ying Meng joined the University of Rochester School of Nursing in July, 2018 after working as a TL1 postdoctoral research fellow at the Clinical & Translational Science Institute at the University of Rochester. She received her MSN and PhD from the School of Nursing at the University of Rochester. 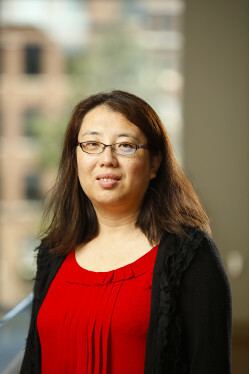 Dr. Meng’s primary research focus is identification of genetic contributions to obesity and ultimately development of personalized lifestyle interventions. In her work, she has explored genetic and environmental factors that contribute to weight gain. She also has conducted large-scale candidate nutrigenetic analysis, large-scale candidate gene analysis on the brain food reward circuitry, and genome-wide gene x gene interaction analysis. Dr. Meng received the Obesity Society Bio-Behavioral Research Poster Competition Award at ObesityWeek 2017.